The Ferengi are a space-faring humanoid species native to the planet Ferenginar. Ferengi civilization was built on the ideals of free enterprise, where all other goals are subjugated to the pursuit of profit. Their governing body, known as the Ferengi Alliance, was formed over a period of ten thousand years, beginning with the establishment of a system of currency, to their purchase of warp technology, and finally to its state in the 24th century. 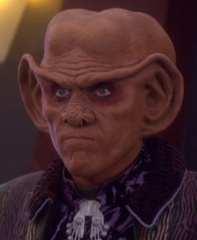 Grand Nagus Glav is the current leader of the Ferengi Alliance.